Colours that are in for each season can be confusing because they are always changing with what is hot on today’s runways. Traditionally warm earthy colours are used for Autumn/Fall; usually matching the leaves when fall arrives. Warm colours such as browns, reds and oranges work perfectly for fall. Here are a few fall choices I found and feel is a perfect start to begin creating your fall wardrobe. DeeTaleZ *THROWOUT* thick knit sweater comes in lovely fall colors. It is rich in color. This will work well with pants or jeans with pumps and shoes. Sweaters are perfect for fall and this is not a thick sweater so can be worn with a blouse underneath to complement it. Beau Mesh screams out autumn not only in colour but in style and pattern. Beau Mesh dress is in one of the autumn colours of brown and works well as a dress on its own or with leggings with Uggs or knee high boots to make it a dressier look. Even though it has touches of blue in the dress, it complements the earthy brown colour and gives it that warm rich look. Now we come to the colour green. It is on the spectrum for Autumn. The ALLFOR50 AUTUMN LOVER GREEN casual outfit is not only cute but also a way of using green in your autumn wear. The pants are ¾ and come with a belt. The shirt also has a hint of green and comes with a scraf for those chilly mornings. This outfit cleverly incorporates autumn colors without blue being the major colour. I feel this ensemble creates such a perfect little fall outfit. This long cardigan is perfect. It comes in all the fall colours also it is just right to be worn with pants or jeans over a t-shirt, or for late afternoon with an open collared shirt. It allows men to also keep in with the fall colours too. 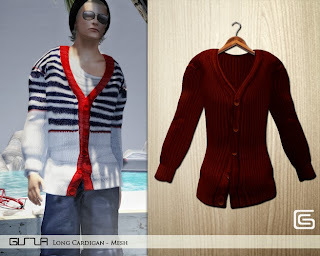 This cardigan is trendy and fashionable and would be a great addition to your fall wardrobe. 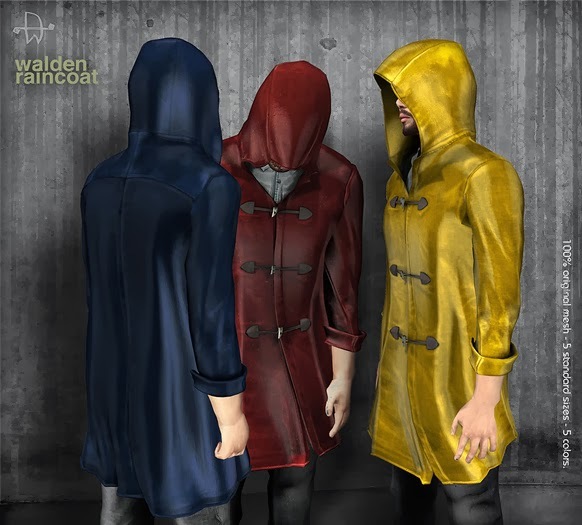 With the weather changing in fall and random outbursts of rain, some guys may not want to carry an umbrella but still want to have protection from the rain while looking fashionable. I found this lovely raincoat which comes in various colours called [Deadwool] Walden Raincoat but the 2 which I feel are perfect for fall are they yellow and red. They are warm and vibrant and just perfect for a damp season. This is an SL Marketplace find and is only available on there. I have shown that even though summer has gone and you feel that the colour chart for clothing for fall could be dull and boring. I have shown you that, yes colours in fall are darker but are also richer in colour. You can still look trendy, stylish and sophisticated once you choose the right style that suits you.